I have done tiny, 300 square-foot additions with greenroofs. 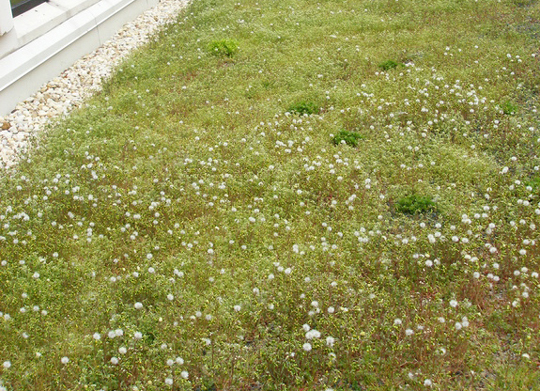 For public buildings with roofs of any size, small to large, owners enter into a service contract, since greenroof installers know how to maintain them properly. It’s true that a greenroof should not be located directly under a huge, mature tree that will drop a three-inch mass of leaves on it every fall. But for most roofs, occasional leaves and sticks will usually blow off. If you want your roof to be a carefully manicured garden, that takes effort. If you want it to absorb stormwater and be pleasing visually, then no worries. The sedums of green roofs create their own detritus, such as flower stalks, which will get brown in the winter. If an owner finds that unappealing, it’s discretionary to go up and remove them w/ a trimmer. There’s nothing about the roof’s performance that requires this. In the spring, these stalks will fall over and be replaced with new growth. It’s more of a natural meadow effect. 95% of the D.C.-area greenroofs are there for environmental effect, not primarily for aesthetics. They are beautiful, nonetheless. Myth #3. Greenroofs need sun and water and nutrients and tending. Anywhere from less than 30% to up to full sun is fine. It’s even fine to put greenroofs in courtyard areas with only indirect light. Indirect or partial sun is actually better than the all-day-long, hot, harsh sunlight that big, commercial greenroofs get. The designer adjusts the plant palette based on sunlight, water, and depth of soil. As a rule of thumb, four hours of sun per day is good. While establishing, greenroofs do require a bit of care. For the first two years, will require 3 to 5 days of care per year. When plants are immature and haven’t rooted in, they do need to be watered. They need almost NO external nutrient. Experts recommend a very light fertilization once a year as part of annual maintenance, but even that is discretionary. Greenroofs never need watering once established. Myth #4. The roof plantings will absorb some water when it rains, but the rest will be runoff, just like from a regular roof. When they first were introduced in this country, greenroofs were not well understood. All the studies had been done in other countries, other climates. Thanks to Penn State and the passage of time, that issue has been resolved. Their studies that tell us for Eastern North America, around 70% of the rainfall never comes back off the roof. A typical rainfall in our area lasts about two hours and measures about one inch. A 4-inch to 5-inch depth of planting media will absorb and retain about 50% – 75% of this water. Up to another 25% of that will be delayed in running off. Think of a dry sponge. Initially, water gets 100% absorbed. As the sponge begins to get saturated, it still absorbs water, but some drips out. Then, you reach a point where it can’t take any more and the water runs off the top. That’s about the equivalent of a one-inch rainfall for a 4-inch to 5-inch greenroof. Once you turn off the water, the sponge is only dripping a little bit. A greenroof works exactly the same way. The water that drains during the rainfall is very slow. After the rain event, it will continue to move very slowly over a day. That’s the benefit for any nearby streams; they won’t receive the entire rush of runoff like from a bare roof. With the rare big storm or deluge, much of the rain will run off, although more slowly than from a bare roof. A key benefit that is sometimes overlooked is that there are significant improvements in the quality of the runoff, as opposed to a bare roof. All the pollution that lands on a bare roof accumulates as grime – nitrates, phosphor-acid – and runs into local streams , adversely affecting water quality. With a greenroof, those numbers are all significantly mitigated. Penn State has also studied this . Getting this sort of water quality treatment with highly-engineered stormwater management systems is very expensive. Our area is blessed with leading experts , a host of built projects, and university research to further the learning. We’ve come quite a long way in the last ten years. This is probably true for most areas of the country. If you’ve made it this far, you are truly hard-core! There is more to learn about greenroofs at greenroofs.com , which includes a directory of projects, forums, events, classifieds, and links to research. One last thought — greenroofs are such an appealing and visible emblem of green building, but they are not universally appropriate in all cases. The design team must consider all the goals and variables of a project to determine the best solution. Great summary! I enjoyed our talk, and am more than please to see you helping to debunk the many myths out there. I’m leaning towards a metal roof, despite myself.